At Béton Prestige, we made the choice to devote ourselves solely to concrete floor polishing. Having become a leader in the field, over time we have developed exceptional know-how on this subject. Polished concrete is an art in itself. Since concrete is a “capricious” material, greater expertise is needed to master all of its features. Always wanting to do better and eager to provide superior quality service, we have refined our work methods over time. Through state-of-the-art processes and equipment at the cutting edge of technology, we are able to provide a quality standard that is appreciated by our customers. From placement to polishing of the concrete, nothing is left to chance. Our team of experts puts its skills at your service. The placement of the concrete is a crucial step for achieving dazzling floors. We are recognized for the impeccable finishing of the wall edges, the uniformity of the grain, and the flatness of the concrete slab. These three factors are possible thanks to our unique concrete placement skills. The edges of the walls must be finished using a steel trowel. Using this technique, the density of the entire floor can be controlled. In addition, the wall edges must be flattened like the rest of the slab. These two factors make it possible to ensure that the slab is flat, and these factors can be controlled only at the time of placement. Floor polishing cannot conceal the defects caused by improper placement of the concrete. For this reason, Béton Prestige provides work that is well done, following good trade practices, in order to deliver the most beautiful floors possible. We produce superior quality polished concrete floors thanks to our diamond grinding technique. This technique consists in eliminating the friable parts (laitance) of the concrete surface to bring out the hard part. The concrete floor then becomes more solid, resistant and shiny. Our high-performance, superior quality equipment works for dry polishing, which does not cause any release of dust or any residual sludge. In addition, no volatile organic compound (VOC) is released into the surrounding air. Dry technology allows for deeper penetration of the densifying products used in addition to providing the option of polishing the floor after the installation of the interior backup wythes. The site work schedule is therefore not compromised and can proceed as planned. To deliver a result that exceeds the quality standards of the market, various steps are necessary. These consist primarily of sanding and polishing. We need to pass over the surface with our machines from 8 to 10 times in order to achieve the desired grain exposure and gloss. Between each step in the polishing process, we apply a densifying sealer that penetrates into the concrete floor. The purpose of applying the sealer is to make the floor denser and even more resistant. Polished concrete floors are a long-term solution, and such protection guarantees that your magnificent floor will have a long life span. 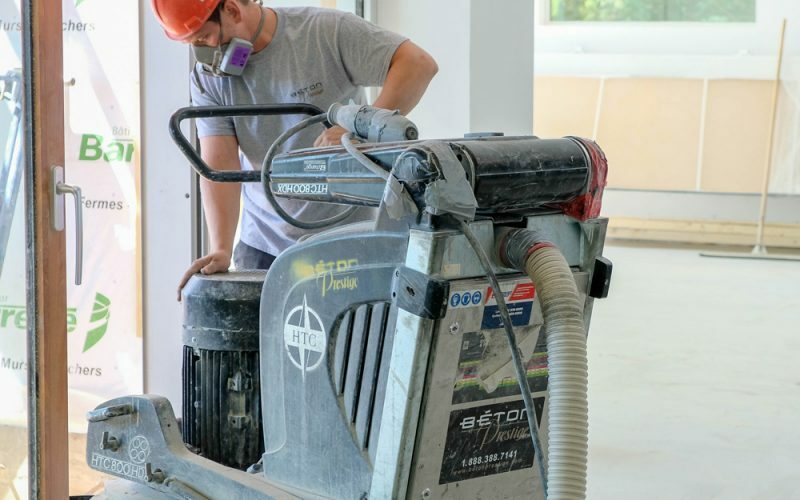 Without specialized equipment, it would not be possible to polish concrete floors. All of our equipment is at the cutting edge of technology, allowing us to provide you with outstanding polished concrete surfaces! We are proud to use HTC Superfloor technology. HTC equipment gives exceptional performances for a superior quality finish, resistance and shine. Our certifications guarantee superior quality that exceeds industry standards.